Hi there! 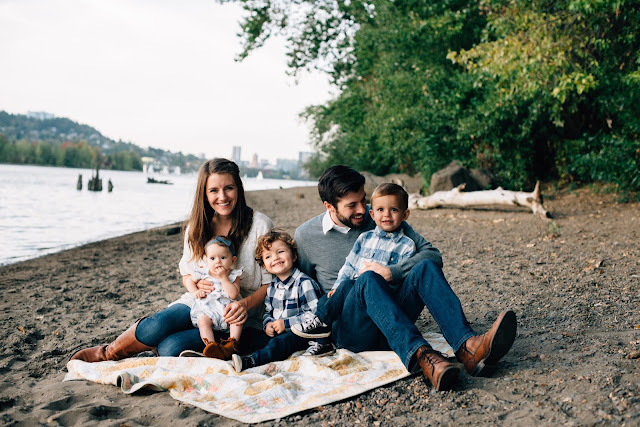 My name is Megan and I am a stay-at-home wife and mama in Portland, Oregon. My husband, Adam, divides his work-days between Seminary and our church. We have three littles (three and under); Elliot (3) Haddon (2) and Annie (1). As I thought about what day I would choose to share and what I wanted to convey from our life I felt overwhelmingly that I should share the mundane, ordinary, messy, boring and the simple beauty that makes up so much of our days. So, I chose a dreary, rainy Monday and I went with it. Annie usually wakes up around this time to be nursed. Adam gets up, grabs her and brings her back to me before he starts getting ready for work. The goal here is to put her back in her crib and get up for the day. Ideally, shower, get some coffee, spend time with Adam and in God’s word…that didn't happen today. Adam put her back in her crib and I slept in a little longer. It’s clockwork. The boys wake up at 7:15AM every day. Sometimes I’ll sit and watch the clock turn and I am amazed at how they start to stir as it reaches 7:15. And, sure enough, I am woken by their sweet and crazy little voices. I quickly jump out of bed because if I’m lucky, I can get them out of the room before they wake Annie. (Like Em, my three also all share a room!) I successfully take both boys into the living room, grab some coffee and we spend a little time snuggling and waking up while the boys tell me the dreams they had during the night. The coffee (finally) kicks in and I muster up the strength to get into the kitchen and start breakfast. We almost always have a heaping bowl of oatmeal and a banana; today we did. As breakfast cooks and the boys play, I get ready for the day. Annie usually wakes up around this time and I bring her to the table and we all sit together and share our meal. Once we’re all done, the boys clear their places and head to their room to get dressed (Haddon still mostly needs help with this task, so he’ll usually brings me his clothes) as I do the dishes from breakfast and start our first load of laundry (including every child’s oatmeal-crusted pajamas). Our Monday’s are almost always the same; it’s our catch-up day. I spend most of the day doing the family’s laundry, cleaning from the weekend, and planning out our week. As soon as the dishes are done and the first load of laundry is going, I go to get Annie dressed for the day. All three of the kids spend some time playing while I make beds, gather thrown-about clothes and open the blinds and curtains. Today, as I am doing these things, I am reminded of what a sweet blessing my children are as I hear them all laughing and playing together… and inevitably, someone got hit in the face with a wooden train track. While Annie takes her morning nap, I start another load of laundry, the boys do some quiet reading time, do a few little chores, play with Lego, do some puzzles and I start to get lunch going. Today I decided to make quesadillas and around 11:30 we all sit down together to share our meal. Lunch-time is really sweet for me; the kids are getting to an age where they engage in real conversations with each other and with me. I wash the dishes from lunch, fold the fresh laundry, move wet clothes into the dryer and start, yet another, load. The kids play during this time, I pick up any loose ends around our 800 square foot home and start to have them wind down for their naps. During this time all three kids take a nap. I spend this time working on my weekly Bible study homework that I didn’t get to earlier in the morning, I listen to a sermon, read my book, check emails and call my mom. I am pretty intentional to keep this time free from housework - I really feel refreshed when the kids get up if I have spent their nap time resting myself. Around 4:00PM we all started to get a little stir-crazy waiting for Adam to come home, so, we put on our rain jackets and go for a walk around our little neighborhood. We made stops at our local consignment shop and the neighborhood grocery store to grab a few things I had forgotten the week before. By 5:00PM Adam is home, homemade pizza is in the oven and the kids are all at their loudest and highest octaves of the day. Monday night dinners are always a little bit earlier and a little bit more rushed; Adam has a 6:30PM meeting so we try to eat more quickly so we have time to do family devotions. All of the kids are ready for bed and I sit on the floor and nurse Annie as I read a story to the boys (right now we are reading through The Book of Virtues and tonight we read about Genghis Kahn and his hawk… again). Once the kids are asleep, I fold all the remaining laundry (sometimes there’s a load that still needs to dry, today there wasn’t) and do the dinner dishes while I wait for Adam to come home. Adam is home by 8:30. We spend some time talking and debriefing from our day, reading our separate books (right now he’s reading Side by Side by Ed Welch and I am reading Bonhoeffer: Pastor, Martyr, Prophet, Spy by Eric Metaxas). We don’t last very long before we decide to get ready for bed and go watch an episode of Parks and Rec. By 10:30PM, we decide we’ve had enough and turn the lights out and go to sleep. And this is another day in our life! To some, our life may seem boring and ordinary. There isn’t a lot of glitz and it is hard-work. I didn’t write down all the times I felt tempted to yell at my children, to throw all of the laundry into a pile on the bed and ignore it, to call my husband and ask him to come home early or to order take-out for dinner (that one happens pretty frequently). It can be tempting when I look at the lives of other women and think, “Wow, my life is so dull compared to hers.” But I am often reminded that there is so much joy to be had in learning contentment in whatever season or calling the Lord has brought us to. I am learning how to find my strength in the joy of the Lord, to be slow to speak and quick to listen and slow to wrath with my family. To seek to walk humbly as I confess my constant need for Jesus. He lived a life of giving himself away and by his death I am empowered to do the same. And, hey! - I am doing what I have always dreamt of doing, but it is not without its challenges. I am thankful for this ordinary, simple and sweet little life with these ordinary and wonderful people. Thanks for reading along! These "boring" days are the stuff of life. The peaceful memories that follow our kids for the rest of their lives. It is hard work, and you do it well. Thanks for sharing! Wow! You are amazing! Making memories and building a strong Christian value in those children. So proud of you and Adam. Also those little ones are adorable!!! God Bless! Wonderful reading about your day. Sounds pretty perfect to me! I have kids close to the same age as you ... 4, 2 1/2 and 6 months. I was just wondering how you do family devotions. I find meal time such a challenge for us. We have a children's bible ,,, but I'd love some helpful ideas. yes I'd love to hear too! You are a BLESSING my sweet daughter in law...I love you so much. Thank you for sharing Jesus in everything you do...Praying for you daily...May God continue to bless you and give you the grace you need to serve him..